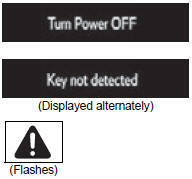 After taking the specified steps to correct the suspected problem, check that the warning message and light go off. The driver¢�s door was opened when the shift lever was not in p and the engine switch was not turned off. → Shift the shift lever to p.
The driver¢�s door was opened and closed while the electronic key was not in the vehicle, the shift lever was not in p and the engine switch was not turned off. → Bring the electronic key back into the vehicle. An attempt was made to exit the vehicle with the electronic key and lock the doors without first turning the engine switch off when the shift lever was in p.
→ Turn the engine switch off and lock the doors again. The driver¢�s door was opened and closed while the electronic key was not in the vehicle, the shift lever was in p and the engine switch was not turned off. → Turn the engine switch off. The electronic key was carried outside the vehicle and a door other than the driver¢�s door was opened and closed while the engine switch was in a mode other than off. The electronic key is not detected when an attempt is made to start the engine. → Start the engine with the electronic key present. An attempt was made to drive when the electronic key was not inside the vehicle. → Confirm that the electronic key is inside the vehicle. An attempt was made to lock the doors using the smart key system while the electronic key was still inside the vehicle. → Retrieve the electronic key from the vehicle and lock the doors again. An attempt was made to lock either front door by opening a door and putting the inside lock button into the lock position, then closing the door with the electronic key still inside the vehicle. The electronic key has a low battery. → Replace the electronic key battery. The steering lock could not be released within 3 seconds of the engine switch being pressed. → Press the engine switch while depressing the brake pedal and moving the steering wheel left and right. Indicates a malfunction in the smart key system → have the vehicle inspected by your toyota dealer. When the doors were unlocked with the mechanical key and then the engine switch was pressed, the electronic key could not be detected in the vehicle. 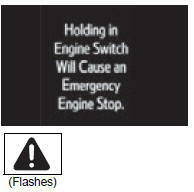 the electronic key could not be detected in the vehicle even after the engine switch was pressed two consecutive times. → Touch the electronic key to the engine switch while depressing the brake pedal. During a engine starting procedure in the event that the electronic key was not functioning properly , The engine switch was touched with the electronic key. → Press the engine switch within 10 seconds of the buzzer sounding. the shift lever was shifted to p from another position with the engine switch in on mode. → Press the engine switch while depressing the brake pedal. 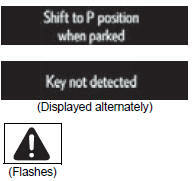 The engine switch has been turned off with the shift lever in a position other than p.
After the engine switch has been turned off with the shift lever in a position other than p, the shift lever has been shifted to p.
Indicates that the engine switch has been pressed while driving → except when emergency stopping of the vehicle is needed, immediately release the engine switch. 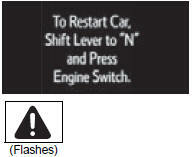 *: The engine may not be restarted depending on the vehicle condition. The message illustrations used are intended as examples, and may differ from the image that is actually displayed on the multi-information display.